Happy to have read this in the morning news today. The college he studied in is 10-15 min away from my house and is not in the top 10 or top 20 colleges of Mumbai. The average salary for graduating engineers in 2nd or 3rd colleges in Mumbai is 4-5 lakhs pa and the offer he got in India was Rs.6 lakhs pa. 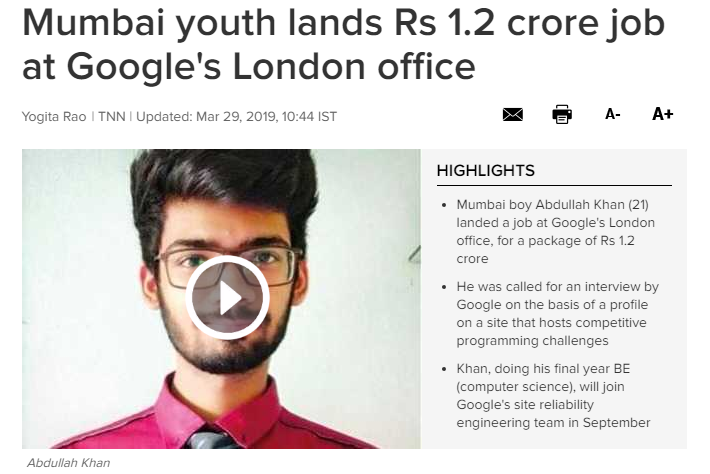 But it was his craze for programming which led him to participate in many coding contests and this is how Google came to know of him. He did not contact Google for any job... Google sought him. He would have got this job even if he was not an engineer!